This morning, the Screen Actors Guild announced the nominees for their 2012 awards and, much like tomorrow's Golden Globe announcements are sure to, there were a slew of surprises both good and bad on the list. The actors make up the largest portion of the Academy, so often the best way to predict the Oscars is to see who and what the actors are (or are not) voting for. A statistic that's been flying around this morning is that no film has won Best Picture at the Oscars without a SAG nomination for Outstanding Performance by a Cast in a Motion Picture, with the notable exception of Braveheart in 1995 (the first year in the award existed). So chances are that one of the following films should be checked off on your Oscar ballot for Best Picture: The Artist, Bridesmaids, The Descendants, The Help or Midnight in Paris. As for the television side of things, just as with the Golden Globes, there is a high chance for WTF-ery when it comes to the SAG nominations. It's probably not worth it to get too worked up over it, though. Television's big night is in August, not February, and these winter awards have way less effect on the Emmys than they do the Oscars. Heck, they don't even have Supporting categories. Psh. Demián Bichir lands a nomination for Outstanding Performance by a Male Actor in a Leading Role for his fantastic work in A Better Life. Many have been counting him out of the Oscar race, and while is still certainly a dark horse contender, this nomination will hopefully launch him back into the conversation. Jonah Hill gets a nomination for Outstanding Performance by a Male Actor in a Supporting Role for Moneyball, which is currently one of my favorite films of 2011. While Brad Pitt is deservedly getting most of the attention for his fine work as Oakland A's GM Billy Beane, Hill was a huge surprise, changing things up from his usual (unwatchable) comedy fare to tackle a quiet, dramatic role. 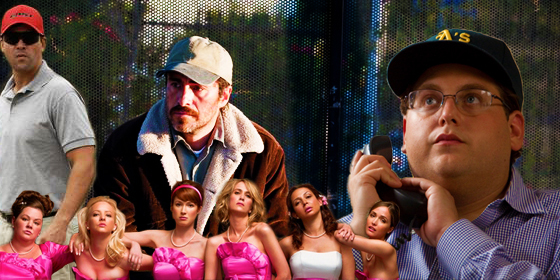 The cast of Bridesmaids receives praise in Outstanding Performance by a Cast in a Motion Picture, a category that isn't usually huge on rewarding comedies. The movie is pretty much a lock to get a Golden Globe comedy nomination tomorrow morning, but unfortunately probably doesn't have much of a chance of sneaking into the Oscars' Best Picture race. Shame. Friday Night Lights' Kyle Chandler receives his first SAG nomination ever, most likely influenced by his recent Emmy win. Of course FNL would get all of its awards love after its cancellation, but at least it's happening at all, right? Clear eyes, full hearts, can't lose. Parks and Recreation gets completely shut out. Say what?! They should easily have grabbed nominations in Outstanding Ensemble, Female Actor (Amy Poehler) and Male Actor (Nick Offerman). Forget what you heard, SAG... Parks and Rec is hands down the best comedy on television right now. Connie Britton does not get to join her TV husband Kyle Chandler on the nomination list, despite two years of Emmy nominations and five seasons of tremendous acting as Tami Taylor on Friday Night Lights. There are certainly more snubs than I've listed—Homeland, Hugo, Drive to name a few—but I only highlighted those I've seen so far. I'm sure as December rolls on and I get to the theater more, that Worst List will grow substantially. For a full list of the 2012 SAG Nominations, click here. DJ Earworm Releases "United States of Pop 2011"